Message From a Burning Bus? Anciently, Moses received a message from God as He spoke from a burning bush. Could I likewise get a message from a burning bus? Right now I live within walking distance of the Mt. Timapnogos Utah Temple. The Temple and the work that goes on there (special ordinances/sacraments for ourselves and our ancesters) were not always so convenient for our family. 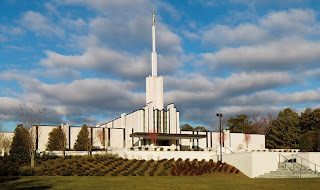 In the late 80’s and early 90’s as we lived in Tampa, Florida, the nearest temple to us was the Atlanta Georgia Temple, which was about 450 miles away. To make it easier for Stake members to get to the temple, every two or three months the Stake would arrange a temple bus trip where we would charter a tour bus for the weekend and make the trek to Atlanta. We would meet at 9 pm on Thursday night at our Stake Center. After traveling an hour north we would pick up some of the outlying members of our Stake and then settle in for an 8 hour trip to Atlanta. We would do our best to sleep on the bus Thursday night. Friday morning we would get to the hotel at about 6 am, change into Church clothes, and then spend the entire day in the Temple. We would sleep in the hotel Friday night and then be back in the Temple by 6 am the following morning. After doing Temple work until about noon, we would make a quick trip to the LDS bookstore and then head back home, getting back late Saturday night. One of these bus trips my wife and I took was very memorable. It was a wintery February, 1990 night and we were just a couple hours out of Tampa when a passing trucker flagged down the bus driver and had him pull off into an approaching rest area. The back of the bus was on fire! As it happened, we were sitting near the back of the bus and many of the older and more feeble members of our Stake were right at the front. As we tried to wait patiently for these older people to “hurry” off the bus, visions of exploding buses from the movies raced through our heads. We finally decided we could not wait for an orderly exit so we opened the bus window and jumped the 8-9 feet to the ground. Everyone made it off the bus safely and some of the luggage was even rescued. A volunteer fire crew from a nearby town eventually showed up but they were more equipped to fight a “brush” fire than to fight a “bus” fire and they were not able to help. The entire bus burned to the ground. I don’t know if this was the Adversary making it hard for us to go to the temple that night or just one of those things that happens with life. But as we stood shivering in that rest area on that cold Florida night, many without any of their carry-on baggage (money, coats, Church clothes, Temple Recommends, etc.) we had a decision to make – do we wait for a replacement bus and try to salvage this temple trip or do we just go home and try again next time? Logic would probably have said to just give up this night and try again next time but to a person, everyone felt compelled to continue on, in spite of the challenges it posed. We did continue on and with some sharing, lending money, and generous accommodation by the Atlanta Temple workers, we ending up having a very spiritual, uplifting, and productive temple trip. This experience is often at the back of my mind as I now live much closer to a temple. Does my effort today to get to the temple match the effort required at that time to get to the temple? Are temple visits ever put off to a “more convenient” time? As Bishop of our ward I am blessed to be able to see the sacrifices so many of our members are making to serve in and attend the temple. 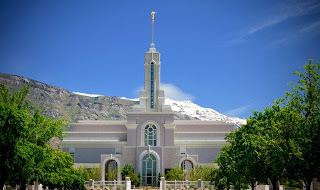 Many of our youth go to the temple often to do baptisms and confirmations – some of them every week. It takes real sacrifice for a teenager to get up at 4:30 or 5:00 in the morning to go to the temple before school or to take a couple of hours out of their busy day in order to serve there. On the other end of the age spectrum, many of our faithful ward members in their 70’s and 80’s are actively spending their retirement years serving in the temple as either patrons or ordinance workers. One faithful brother in his 90thyear is still working at the temple each week. I hope that my effort to go the Temple matches that of our youth and our older ward members and matches that of a bus-full of Florida Church members in a lonely rest area in the middle of a wintery Florida night. Missionary with a great companion	“Mormon Helping Hands”- not just a church program but a way of life.